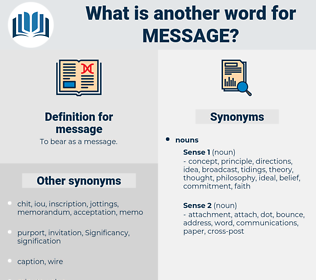 What is another word for message? Telecommunications, remarks, consignments, SMS, data, advisories, points. Emails, faxes, inputs, pieces, connections, calls, consignments, SMS. Telecommunications, data, sign, voicemail, massage, legacy, warning, idea, cipher, image, voice. addressed, said, Meant, Wrote, called, Was, left. sent, said, used, CODED, written, contacted, known, required, dated. speaks, seems, says, states, posts, Does. That message ought to go through. Can you send a message for me? maxi, mawkish, mays, masa, mousse, ming, mess, moxie, msg, masses, monish, minimize, mushy, moschus, mayaca, mocha, minus, mayacaceae, myg, meek, minimum wage, masseuse, monkey, moss, mensch, manna ash, Ms., missus, mining, Micah, magi, mus, meninx, mask, mince, mahuang, mag, manic, Minimus, mnemonic, manx, magh, muse, musky, mesic, manis, messiah, mnemonics, MAK, mongo, maja, max, maize, much as, mimesis, miosis, maze, menace, muss, mannish, mango, mayonnaise, mimosa, Minnie Mouse, mimus, muggee, Magha, mimosaceae, muggy, mock, mucus, musgoi, msh, monoecious, mniaceae, magic, mujik, meshugaas, mesua, mickey, moksa, moaning, meiosis, mazy, mhz, macaca, Micaceous, mg, momos, manque, monk, masse, manchu, musaceae, mashi, miscue, minge, moussaka, mooch, muzhik, moujik, munich, minimise, mezzo, mansi, msasa, mons, mongoose, Massawa, misgauge, macaw, meuse, Mauna Kea, menage, mwanza, mensh, mycosis, mosey, music, misuse, musci, MEK, munjuk, mensa, missy, myiasis, meninges, moneses, mezuzah, mysis, mexico, means, meniscus, maniac, miwok, mousey, mesh, manse, mx, magic eye, mouse, meshugga, mosaic, mayeng, maguey, macaque, mesozoic, munja, missis, mush, mojo, mass, mac, momus, men's, magus, mc, monas, munj, MKO, man jack, muzzy, monomaniac, massasauga, moses, MCIA, managua, msc, manky, manage, musca, monecious, macau, musk ox, masque, mcg, mimic, mangy, muskogee, meshugge, mm hg, mashie, mosque, meaning, messuage, mangey, menziesia, msec, mix, mousy, musgu, make way, mug, mews, mecca, massage, mako, minacious, muzjik, miss, manioca, meq, mossy, maquis, mingy, Monoicous, mash, mick, musquash, make hay, mussy, mummichog, Meno Mosso, minsk, mohawk, myosis, mishegaas, mezuza, mesa, mace, mucosa, Micheas, menses, monaco, muck, mica, ms, musk hog, mucous, moscow, Mimamsa, messy, Manes, Manichee, masai, mink, musa, meanness, mike, moose, mosh, maikoa, myaceae, moke, minos, monegasque, muncie, meshuga, musk, manus, mucky, minkowski, mucose, make, macho, manioc, meg, minx, macao, monkish, moo-cow, mahagua, mack, mach, mange, munch, much, majagua, mishegoss, mung. dedication, phone message, wire, inscription, cipher, telephone message, radiogram, telegram, packet, mail, broadcast, cypher, heliogram. 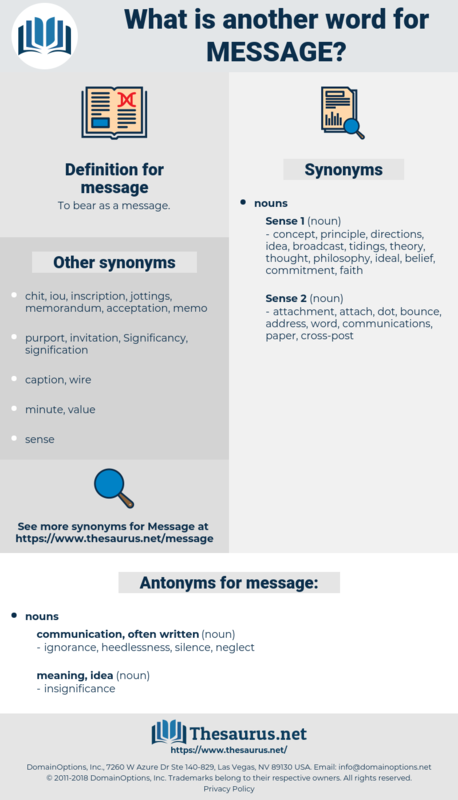 communicate, put across, pass along, pass on, pass.